Can you say COLD....It was 33 degrees as we waited in line to get in. My Friend Robin treats me for my birthday each year. I so look forward to going. This year we needed our scarves and gloves. As always the show is a delight for your eyes ! Shivering in line...what some people will endure to see GREAT antiques and Wonderful displays. This was one of our favorites...The crows on the bike were so cute ! Love the Pumpkin and Gourd stack that they do each year. We each found a few Treasures that had to go home with us. If you get a chance...GO... it is a GREAT Show. Been painting like a Crazy person.... What I could not reach with my 12 ft ladder , Hero was able to reach...SCARY up there. So much to do in so little time. Wanted the porch to have it's first coat of paint before the Country Living Show this coming weekend. So excited to be going . Christmas Open House is four weeks away..... Planning all the fun things to have done in the shop ! Stop by this weekend and say Hi. It is so fun to see old Friends when they come to town. 1910 Public House is now open for Brunch on Saturday and Sunday...Yum. Hero and Joe got the railing up ! It looks so good. Today the bottom posts should go on. It is so exciting to watch it evolve. This is the view from the porch...looking across to City Hall. We are up there ! Sunday the tin was put on...I have a roof ! A beautiful dark green one. Looking for some old wood to use to cover up the rafters. Hoping that when we finish the porch it looks like it has always been there. Today the railings should be started . I climbed through the window...being brave...just had to see what it was like. The right window will become a door soon. I have lots of painting to do. The porch will be moss green and black like the shop front. Lilburn Daze was on Saturday...we had a great turn out ! Our little Town was bustling. Love seeing it so busy ! 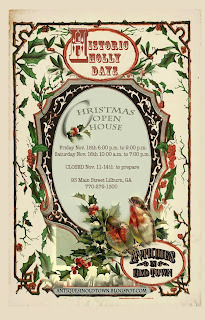 Only 5 weeks until Christmas Open House....Better get BUSY !!!!!! So many have called to find out when our Christmas Open House will be. 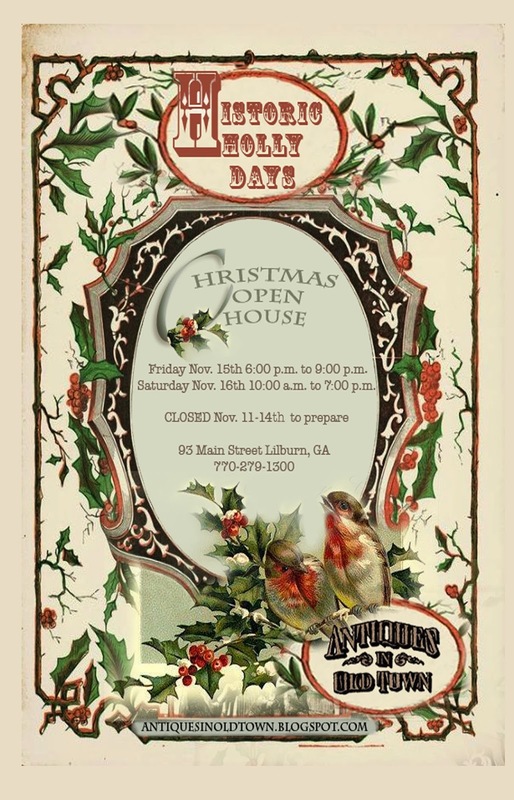 Historic Holly Days will be on Friday evening November 15th from 6:00 pm to 9:00 pm And Saturday November 16th 10:00 am to 7:00 pm The Shop will be closed November 11 th thru the 14th to prepare. We now have a floor...today the next layer will be added ! Love that Bittersweet. It screams Fall. The vintage round graters are so neat . Rosehips and oranges smells SO GOOD ! Burlap Pumpkins and Sunflowers make me Smile ! Vintage Halloween....Can we say ORANGE. Exciting things are happening at Antiques in Old Town ! A new two story porch is being added to our building... So excited ! Fun to watch the progress. Halloween and Fall decor are in the shop now..come on by and see. We WON ! Second place in the Scare Crow Contest....Something to CROW About ! Hero and friend Joe..working on getting the steel frame up. Here comes the WOOD...Yea ! Pumpkin Man is guarding my morning glories ! I could not bare to rip them all out. Guess my Fall crop will have to wait a while. I just love his happy face...don't think he will scare away any crows though. They may like sitting on him ! This one is Jimi and Nancy's . She is SO CRAZY ! Come on by the Gardens and see all these great scare crows... The Community Garden is judging them tomorrow. Can not believe it is October already... Lilburn Daze Art Festival is only two weeks away. Put October 12th on your calendar and come join the FUN !